The Gyral Small Seeds Box is an addition to our product line that can be readily fitted to almost our entire range of Air Seeders. It was primarily developed to meet the needs of those farmers who wish to establish pasture when planting. It may also be used for planting Summer Crop in wide rows. This allows the main seeder bins to be available for applying heavier fertilizer rates than would normally be possible. 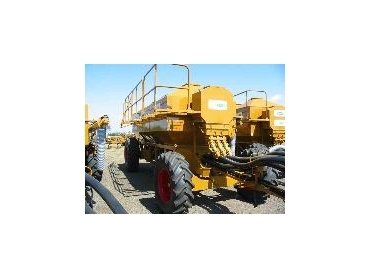 Option 1 - The Small Seeds Box can be mounted on your Gyral seeder Air Seeder with the primary hose delivering to an hydraulically driven Distributor Head mounted at the rear of cultivator. The secondary hoses from the Distributor head can be arranged to plant on top of the soil in front of covering harrows or through a sowing boot. Option 2 - An Incorporated Small Seeds Box allows small seeds to be sown in conjunction with the Main System. This system can be changed to a Single System (as in option 1) by fitting 1 or 2 Distributor Heads and Adaptors to give the farmer greater flexibility. Gyral Small Seeds Box utilises our patented pressurised bin system and with its positive feed mechanism will handle a wide range of small seeds and summer crop grains. Other options include 1 or 2 head configuration, poly pipe or super-elastic secondary hose, deflector or sowing boot option.